Way back in 1993, Christian Louboutin was working on a shoe inspired by Warhol's "Flowers" when he thought something was missing. 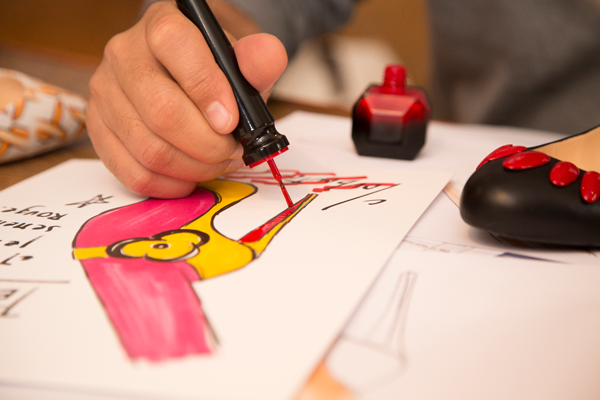 His assistant was nearby painting her nails when he grabbed the bottle from her and painted the sole of the shoe red - and thus began the legend of his signature Red Sole. 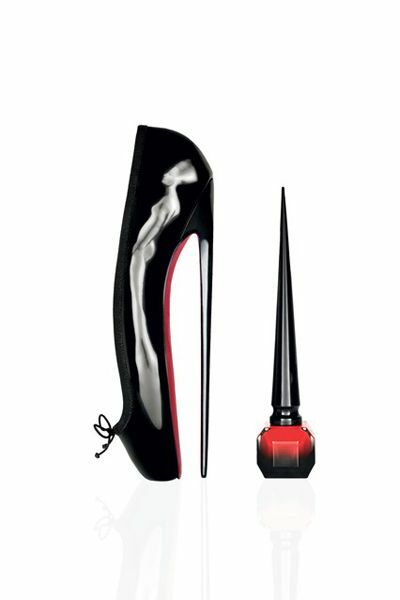 It's come full circle now with the recent release of Louboutin's nail polish range as part of a new beauty collection. The full collection consists of 30 nail lacquers divided into 3 categories - Pops, Nudes and Noirs and the signature Rouge. I think my heart pretty much stopped when I woke up to the news a few weeks back and it was pretty much a given that I would stop at nothing to get my hands on a bottle of Rouge Louboutin! Thank you J for helping me bring purchase this! 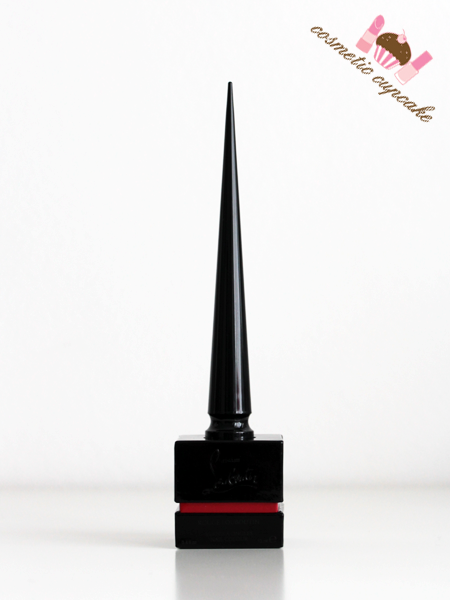 "Rouge Louboutin… a timeless, vibrant red suited to any skin tone. A true objet d’art of a dramatic 8-inch height inspired by the tallest heel Christian Louboutin ever created- the Ballerina Ultima. The iconic Rouge is encased in a faceted, weighted glass bottle with an unique ombré effect. The tall slender cap, inspired by calligraphy, turns the application into a luxurious experience, inviting women to take their time. The custom-designed, patented triangular brush picks up the right amount of formula, without air bubbles, to deliver flawless, chip-resistant coverage. A highly pigmented, super glossy formula delivers in just two coats the effect of 20 layers of traditional lacquer. Enclosed in a patent leather like finish presentation box with a red reveal." 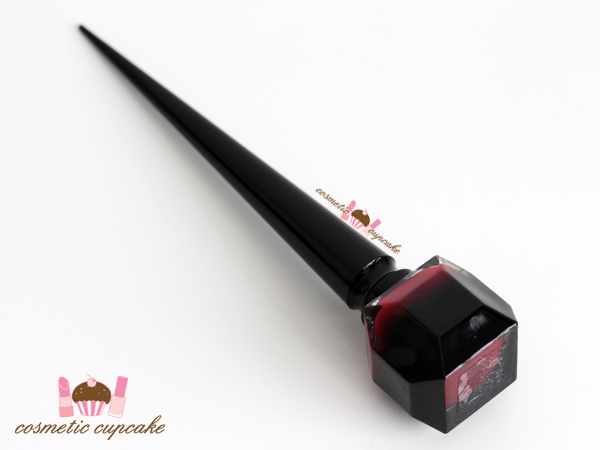 The bottle is amazing and consists of a heavy red black ombre glass bottle with a tall pointy cap that stands at an impressive 8 inches. It's inspired by the tallest heel Louboutin ever created - The Ballerina Ultima Shoe and is definitely meant to be displayed. Not that it would fit into my helmer!! The cap looks extremely scary but it's surprisingly easy to use and I held it like a pen to apply. The brush is firm but flexible and easy to use. 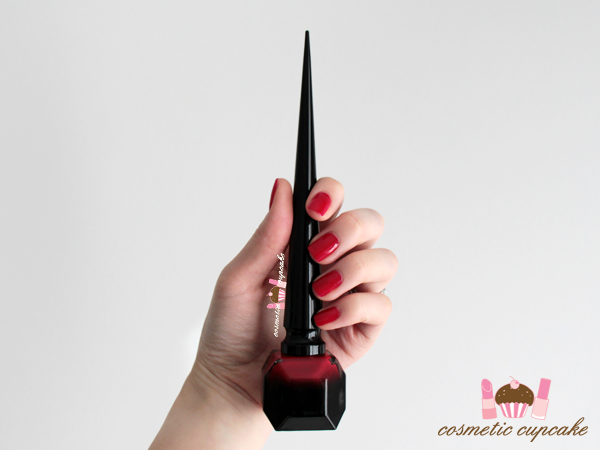 Rouge Louboutin is a classic blue based red creme. 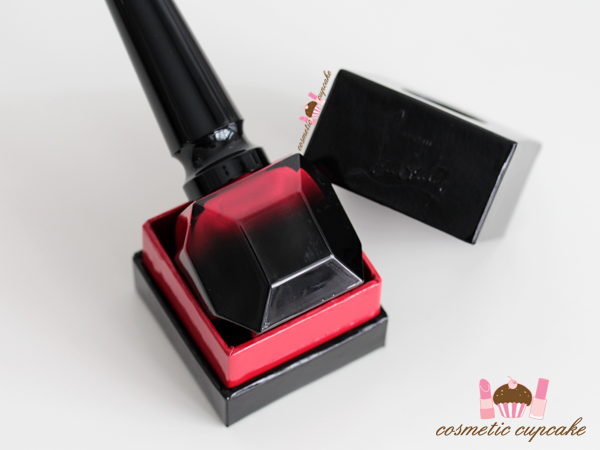 It's highly pigmented, ultra glossy and self leveling and is pretty much perfection. Oh oh what is not to love!! Pictured is just one perfectly opaque coat with no top coat. 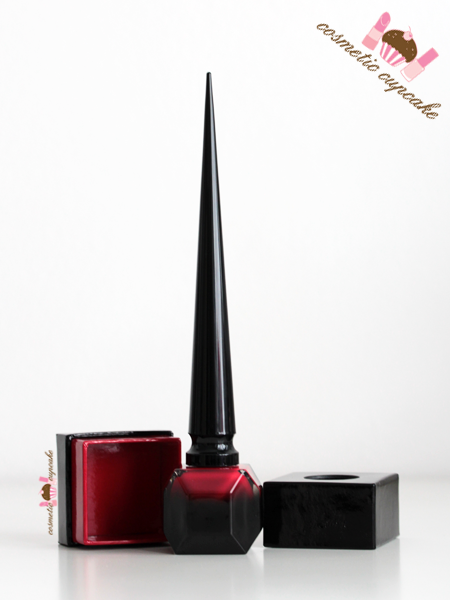 Overall: Rouge Louboutin is hands down the pride and joy of my nail polish collection. At $50 it is damn expensive even for an avid polish collector like me and I'm sure there's a red creme out there that's very similar at a fraction of the cost. The formula is pretty much perfection and the bottle and packaging is amazing but it's what you think is worth it when it comes to polish. Having said that though, for lovers of his signature heels and luxury polish collectors it's a must have splurge item. Plus it's so much more affordable than a pair of his heels! I am completely biased when it comes to items like this though haha! Details: Christian Louboutin Rouge Louboutin is available now from Sephora, Nordstrom, Saks, and Louboutin boutiques and online for $50US and in Hong Kong from Lane Crawford IFC for $450HK. Not sure of the Aus release so your best bet is to ask someone to mule it for you! The bottle is beyond gorgeous - but I find the colour a bit meh ... Don't get me wrong it's really nice and it matches Christian Louboutin shoes perfectly (*_*) ... O.K. I'm just miffed off about the price and that it's out of stock ... *folds arms and pouts* - I love reds (;_;). It's beautiful! LOL!! The price is waaaaaaaaay too steep even if it's Louboutin polish but I just had to have it x) Hope you get your hands on a bottle when it's back in stock! Amazingggggg photos!!! You definitely did it justice and I thought of you as soon as this news was released! Mine is on it's way and I can't freaken wait!!! But my photos won't be like yours haha. Great post as always!!! Love the actual heels too! I definitely can't afford those! Eeeeek I hope you get your bottle soon!! You will LOVE IT. Your pics will be amazing I know it! And thanks heaps hun, I took so many photos to try and do the polish justice lol. GAH it's so beautiful!! Oh wow! Love the pictures in this post - I love that you consistently compared the polish to the actual Loubutins! Glad to see that the actual quality is on par with the price! I'm so excited that you got your hands on it - I've never heard of the story about the assistant! 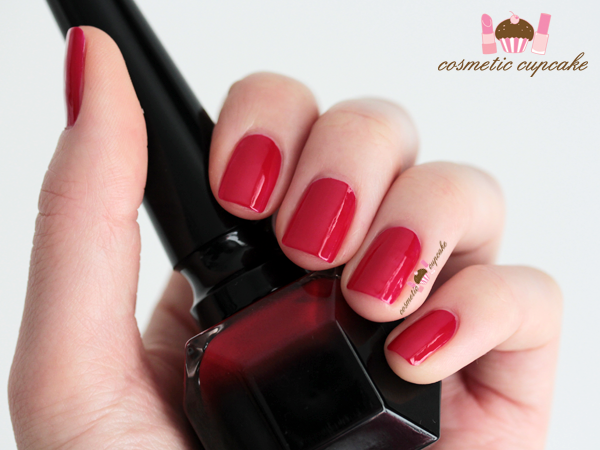 ^^I agree i love the pics for this post, the polish, while probably dupable, looks so lovely! Like lacquered candy. Does the colour change much with more coats? Thanks hun! Oh I love your description of the shade! Hmmmm I'm not too sure actually before I only did 1 coat but will make note next time I use it. Awww thanks! I absolutely love my rings but I can't take credit for them lol. My engagement ring was a surprise and my hubby designed it himself and my aunty's friend helped us with my wedding band. Cosmetic Cupcake Nails NOW HAS A HOME!! Nail art book and favourites giveaway winners!